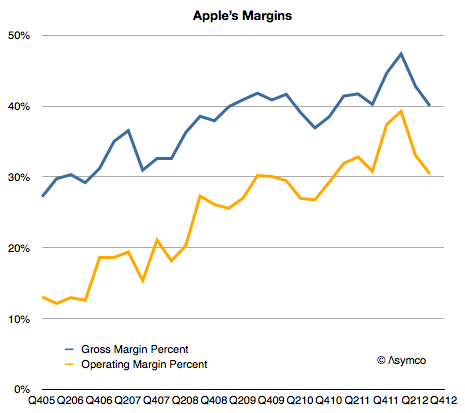 As the following graph shows Apple gross margins and its operating margins have both been on a consistent upward slope since early 2006. 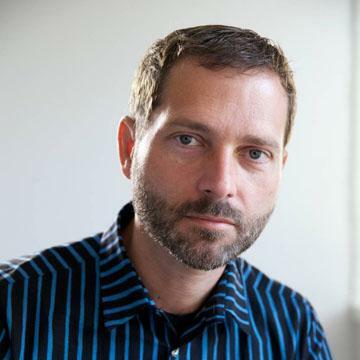 The reason is that the company has moved to more mobile devices as a percent of products shipped. Whereas Macs have had decent margins by the standard of the PC industry, they are not as profitable on a unit basis as iPods, iPhones or iPads. As portable or mobile products grow rapidly, it would follow that margins would as well. However, the growth is not monotonic. There are occasional dips in gross margins. The cause is the launch of new device versions. On the following graph I show the launch times for the iPhone versions and the company’s gross margin as well as my estimates for iPhone and other product line margins. 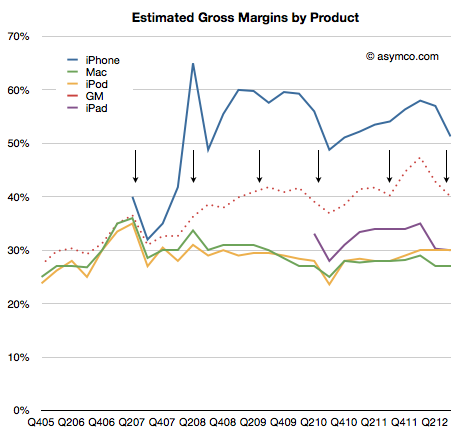 The general pattern is clear: each new version of the iPhone causes a dip in gross margins. This is not surprising as the company forewarns of this (in a decidedly exaggerated manner.) But why does it happen? Every launch causes an amplification of these learning effects. With each dip in margins however, comes another surge as the learning is complete and the volumes of the new generation product begin to dwarf the previous. And so the process continues. There is an asymptotic limit to margins as they cannot grow higher than whatever the iPhone yields but that’s not yet in sight. The upper bound is probably in the 50% range.